I don't know about you, but Sophia has quickly made her way into the hearts of everyone I know! 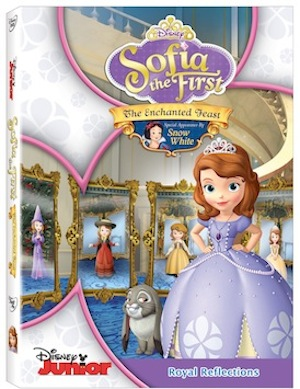 We love this little princess and cannot wait to see the newest episode, Sofia the First: The Enchanted Feast, coming to DVD August 5th! The synopsis says, "The wicked fairy, Miss Nettle, disguises herself as a powerful sorceress and attempts to steal Sofia’s magical amulet. With the help of Snow White—Sofia must learn to trust her instincts and speak up when she suspects someone is not who or what they say they are.